Urban Turf, a local D.C. real estate blog, wrote an article in December of 2015 declaring that $2 Million is the new $1 Million in D.C. They wrote this article based on a blog post by District Measured that asserted $1 million should not be used as a threshold for the luxury market because it is now too commonplace. The Tysons Corner area is certainly not Washington, D.C. but the real estate market is quickly becoming just as expensive, maybe just with some extra space. It’s difficult to define luxury because it is so subjective. When I moved out of my college dorm room into an apartment, that two-bedroom apartment with its own kitchen and my own bathroom was luxury as far as I was concerned. As I’ve aged, I now look at luxury with a different lens; high-end professional appliances, great location, my own gym in the house and separate closets and bathrooms for me and my husband. I have worked with clients whose idea of luxury is no less than an unobstructed view of the Potomac and every luxury imaginable including a wine cellar, elevator in the home, a kitchen for the family and another one for the caterer, and private space for each member of the family and guests. District Measured’s Steve Giachetti justified the new threshold with the fact that in 2015, over 18 percent of all single-family home sales in the District were over $1 million compared to 3 percent in 2001. In that same year, only four percent of homes in the District were over $2 million, making it a more “luxurious” price point. In the Tysons Corner area, which I’m defining as Falls Church, McLean, Vienna and Great Falls, there are currently 557 detached homes on the market. Detached homes are most often considered the standard for suburban living so I’m using this type of home for the purposes of looking at luxury in our area. The lowest priced detached home currently on the market is priced at $437,000 in Falls Church. The highest priced detached home currently on the market is priced at $24 million in McLean. The chart below shows the breakdown of detached homes currently on the market in the area. Over half of all detached homes currently on the market are listed for between $1 million and $2 million. 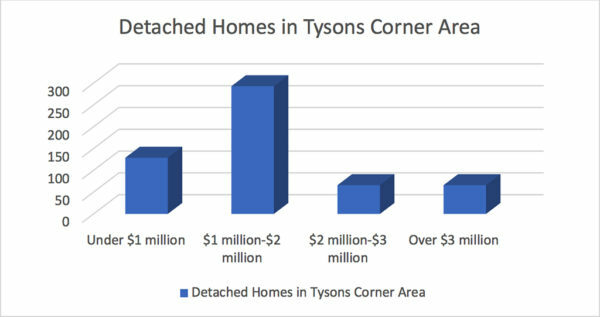 Since only 30% of detached homes on the market are under $1 million while almost a quarter are over $2 million, it may even be said that luxury in the Tysons Corner, that $3 million is the new $1 million. Don’t worry, there are still deals to be found and there are still some pretty great homes on the market well under $2 million. This week I’m featuring a home that I also featured last week with an amazing backyard. 8518 Wedderburn Station is now below $2 million and still just as breathtaking.